and Technology, 12, 771-777, (2001), (the journal's most downloaded paper of 2001). Sandeep Vohra, Electronics Letters, 36, 1688-1689, (2000). "A Passive, Light Intensity-Independent Interferometric Method for Fiber Bragg Grating Interrogation," M.D. Todd, G.A. Johnson and C. C. Chang. Electronics Letters, 35, 1970, (1999). "Synchronization and Imposed Bifurcations in the Presence of Large Parameter Mismatch," G. A. Johnson, D. J.
Mar, T. L. Carroll, and L. M. Pecora. Physical Review Letters, 80, 3956 (1998). and H. G. Schuster, Physical Review Letters 76, 400 (1996). "Spatiotemporal Stochastic Resonance in a System of Coupled Diode Resonators," M. Löcher, G. A.
Johnson and E. R. Hunt, Physical Review Letters 77, 4698 (1996). "Assessments of Grating-Based System Performance Characteristics in Practical Structural Applications," M.
"A System for High-Frequency and Quasi-Static Fiber Bragg Grating Interrogation," G. A. Johnson, M. D.
Todd and S. T. Vohra, Proceedings of the 14th International Conference on Optical Fiber Sensors, Venice, Italy, 2000. "Rayleigh Scattering Based Distributed Sensing System for Structural Monitoring," R. Posey, G. A.
Johnson and S. T. Vohra, Proceedings of the 14th International Conference on Optical Fiber Sensors, Venice, Italy, 2000. Optical Fiber Sensors, Venice, Italy, 2000. "Modular Fiber Optic Hull Monitoring System with Real Time Signal Processing," G. Sagvolden, K. Pran, G.
International Conference on Optical Fiber Sensors, Venice, Italy, 2000. "Surface Effect Ship Vibro-Impact Monitoring with a Distributed Array of Fiber Bragg Gratings," Gregg A. Proceedings of the 13th International Modal Analysis Conference, San Antonio, Texas, 2000. "Control of Chaos in Electronic Circuits," G. A. Johnson, M. Löcher, and E. R. Hunt, in The Handbook of Chaos, edited by H. G. Schuster, (Springer-Verlag: Berlin, 1999). "Stealth Communications," T. L. Carroll, G. A. Johnson and L. M. Pecora, Surface Warfare, 23, 30 (1998). "Controlling Chaos in Electronic Circuits," G. A. Johnson and E. R. Hunt, in Nonlinear Dynamics in Circuits, edited by T. Carroll and L. Pecora (World Scientific: Singapore, 1995). "Keeping Chaos at Bay," E. R. Hunt and G. Johnson, IEEE Spectrum, pp. 32-36, (Nov., 1993). "Optical dispersion compensation using a nonlinearly strained fiber Bragg grating," S. T. Vohra, E. Boettcher and G. A. Johnson, Patent No. 6,944,372. "Optical channel monitor with continuous gas cell calibration," G. A. Johnson and B. L. Althouse, Patent No. 6,619,864. "Multipassband scanning filter approach to calibration and optical monitoring of C and L bands," B. L. Althouse and G. A. Johnson, Patent No. 6,993,257. "Passive, temperature compensated techniques for tunable filter calibration in bragg-grating interrogation systems," G. A. Johnson, B. L. Althouse, G. Nau, Patent No. 6,573,489. "Optical sensing device containing fiber Bragg gratings," G. A. Johnson, M. D. Todd, C. C. Chang and B. L. Althouse, Patent No. 6,674,928. "Synchronizing autonomous chaotic systems using filters," T. L. Carroll and G. A. Johnson, Patent No. 6,370,248. "Alumni Profile: Angel Melendez '17, Service Engineer for IMS Systems, Inc.," Point Park University website, Sept. 18, 2017. "Engineering Students Design New Annunciator Call System for Turtle Creek Fire Department," Point Park University website, May 31, 2017. "Electrical Engineering Major Offered at Point Park for Fall 2016," Point Park University website, April 1, 2016. "Chaos Topic of Electrical Engineering Technology Professor's Lecture," Point Park University website, April 11, 2014. "Engineering Technology Students Build Camera Dolly for Photography Department," Point Park University website, May 21, 2013. 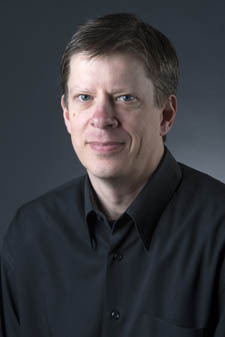 "Faculty Profile: Gregg Johnson, Electrical Engineering Technology," Point Park University website, Oct. 12, 2012.